Here is the list of the hotels near Sallespisse. Book your hotel near Sallespisse today, Monday 13 May for the best price, reservation and cancellation free of charge thanks to our partner Booking.com, leader in on-line hotels reservation. Below here is the list the 50 closest hotels of Sallespisse, sortable according your criteria. You will find the position of these accommodations on the Sallespisse hotels map. Featuring barbecue facilities and a garden, La Bascobearn offers accommodation in Bellocq with free WiFi and garden views. The holiday home has city views and is 31 km from Dax. The holiday home is located on the ground floor and features 2 bedrooms, a flat-screen TV and a fully equipped kitchen that provides guests with a dishwasher. The property also has 1 bathroom with a shower. The holiday home offers a terrace. Guests can also relax in the shared lounge area. Orion is 15 km from La Bascobearn. Pau Pyrénées Airport is 57 km away. Set between the Basque coast and the Pyrénées, this hotel is located next to a golf course. It has an outdoor swimming pool and en suite bedrooms with free Wi-Fi. All rooms have a flat-screen satellite TV and a balcony overlooking the park or the swimming pool. Most of them are air conditioned. Communicating rooms are also available for groups and families. The Hotel du Golf Le Lodge’s restaurant offers daily continental breakfast and regional Aquitaine cuisine. Meals are served in the dining room or on the covered terrace, which is heated in winter. Guests can relax at the bar or in the library, by the fireplace. Located in Salies De Bearn thermal city, the Hotel du Golf is just 800 metres from a large spa centre. Local activities also include fishing, cycling and skiing in winter. Surfing is possible, as Biarritz and St Jean de Luz are just a 45-minute drive. The Hotel du Golf Le Lodge provides free private parking on site. 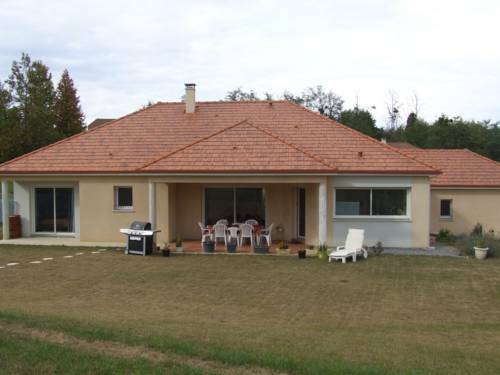 Located near a golf course in Salies-de-Béarn, Les Cottages du Saleys offers self-catering cottages. Guests have free Wi-Fi access and free private parking on site. The holiday homes at Les Cottages du Saleys offer contemporary decoration and furnishings. Each home has a private terrace, a living area with a flat-screen TV and a private bathroom with a bath or shower. Guests can prepare homemade meals in the kitchenette equipped with a refrigerator, oven and stove. Guests will find restaurants just 5-minutes away in the Salies-de-Béarn village centre. Guests can visit a salt museum and a casino just 1 km away or play golf on site. The Orthez Train Station is 20 minutes away and guests will find a spa just 800 metres away. This hotel is located between Biarritz and Pau, next to the Salies de Bearn golf course. It offers individually-decorated rooms with a private balcony or terrace that overlooks the golf course. Rooms at Hotel Helios are equipped with free Wi-Fi access and a flat-screen TV. Each room has en suite facilities. A continental breakfast is served daily at the Hotel Helios. The restaurant offers traditional French cuisine, and meals can be served on the terrace or in the dining room. The Helio Club House provides a golf equipment rental service. Free parking is available on site and Biarritz is a 50-minute drive away. Located a few metres from the centre of Salies-de-Béarn, this old mansion was built in the 18th century. It features a vegetable patch, a garden and a terrace. The elegant rooms are traditionally decorated with parquet flooring. The heated, double rooms have a private bathroom with free toiletries and a hairdryer. They feature a garden view, a seating area and free Wi-Fi access. The homemade, continental breakfast can be served by the fireplace or on the terrace when the weather is fine. It includes fruit salads, French pastries and jams. The guest house is located 300 metres from the thermal baths and a 2-minute walk from the casino. Salies-de-Béarn Golf Course is only a 6-minute walk. A B&B located in Salies-de-Béarn, Le Trianon de Salies is set a mansion with a 5000 m² garden and a shared lounge. The city casino and thermal baths centre are located within a 5-minute walk. At Le Trianon de Salies, all rooms include free WiFi access and a private bathroom with a bathtub or a shower, a hairdryer and free toiletries. Breakfast is served daily. Guests can find restaurants nearby and the suite also has a kitchenette with a microwave and a dining area. Bicycles rental is available at the property, while hiking and biking can be enjoyed in the surroundings. Puyoo Train Station is located a 9 km away and Bayonne is a 45-minute drive from the B&B. Chambre d'Hôtes Les Renards is located in the centre of Salies-de-Bearn. This B&B built in 1901 offers a garden and a terrace with outdoor furniture, as well as barbecue facilities and free Wi-Fi access. The air-conditioned rooms come with a wardrobe, chest of drawers, bedside tables, and tea and coffee making facilities. They also have a hairdryer, free toiletries and a view of the garden. In the morning a continental breakfast with bread, pastries, homemade jams, cakes and fresh fruit is served. Upon request, an English breakfast can be prepared. In Salies-de-Bearn guests will find restaurants and bars. A golf course is located 3 km from the B&B, while horse riding is possible 9 km from the property. Biarritz-Anglet-Bayonne is a 47-minute drive away. On site, free parking is possible. Offering free WiFi and garden views, Laroumette is an accommodation set in Salies-de-Béarn. The property has city views. This apartment comes with a living room and a fully equipped kitchen with an oven. Dax is 38 km from the apartment. The nearest airport is Pau Pyrénées Airport, 62 km from Laroumette. Les jardins du SEL is located in Salies-de-Béarn and offers a garden and a terrace. Guests staying at this holiday home have access to free WiFi. The holiday home is composed of a fully equipped kitchen, and 1 bathroom. A flat-screen TV with satellite channels is provided. Dax is 36 km from the holiday home. The nearest airport is Pau Pyrénées Airport, 60 km from the property. Le Nid du Saleys is set in a typical Salisian town house located 200 metres from Salies-de-Béarn's spa. Free WiFi access is available. Each accommodation will provide you with a TV, laptop and a seating area. There is a full a kitchenette with a microwave and a refrigerator. Featuring a shower, private bathrooms also come with a bath and a hairdryer. Other facilities like an ironing service and laundry facilities are offered. Activities in the surrounding area include golfing, cycling and horse riding. The property offers free parking. Biarritz - Anglet - Bayonne Airport is located 48 km away. Résidence Royal Béarn is located in the centre of Salies De Béarn and facing the thermal baths and 20 metres from Pavillon Saleys Convention Centre. All of the studios have electric heating, a kitchenette with a fridge, TV and free Wi-Fi internet access. Some also have a terrace or balcony, and bed linen and towels are provided. There is also a free shared laundry. Royal Béarn sits in a natural area just 1km from the golf course. It is half way between Pau and Bayonne (40 minutes by car) and 15 km from Orthez. Villa Hortebise is located 600 metres from Salies-de-Béarn town centre and 7 km from Puyoo Train Station. It offers bed and breakfast accommodation with a garden, terrace and free Wi-Fi corner. The rooms have garden views and a private bathroom with bath or shower, hairdryer and free toiletries. In the morning, hot beverages, cheese, homemade muffins, pancakes or waffles, fresh fruit or fruit salad, and eggs upon request are served. On Sundays, Mondays and Thursdays, guests can share an evening meal including local and seasonal produce with the owners upon request and reservation. 16 km from A64 motorway, Villa Hortebise is just 1 km from Salies Spa Resort. Anglet Airport is 48 km away. Located in Salies-de-Béarn in the Aquitaine Region, 49 km from Pau, Hôtel du Parc boasts a hot spring bath and fitness centre. The hotel has a sun terrace and views of the garden, and guests can enjoy a meal at the restaurant or a drink at the bar. Hôtel du Parc features 50 rooms, all fitted with a flat-screen TV. Free WiFi is available throughout the hotel. You will find a cash machine at the property. You can play mini-golf and squash at the hotel. Bayonne is 44 km from Hôtel du Parc, while Dax is 28 km away. The nearest airport is Pau Pyrénées Airport, 42 km from the property. Below here is the hotels map of Sallespisse. Names and details of Sallespisse hotels can be shown on the map clicking on the prices icons.